The Joseph Selle Collection of street vendor photography. Joseph Selle (1906-1988) operated as Fox Movie Flash (at 942 Market Street in San Francisco) from the late 1930s until his retirement in the 1970s. Selle and photographers he hired operated as bonded, uniformed street photographers primarily in the Union Square area, San Francisco's predestrian dense, primary retail space of that era. 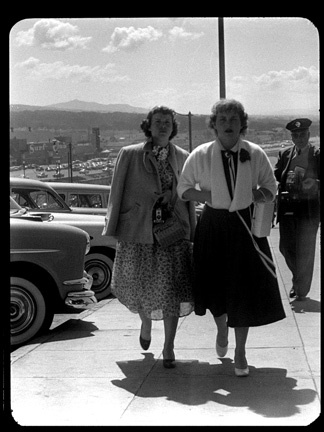 Their simple business model was to photograph pedestrians usually without asking permission, then handing them a numbered ticket in hopes the tourist, or the dressed up shopper, or the couple on a date would purchase sight-unseen the small, inexpensive souvenir photograph delivered later by mail. By sheer hustle - taking 100s of grab shots daily - Selle and his associates were successful at this business over a period of many years. They became fixtures around Union Square, and must have also been recognizable from frequent trips to the parking area at Cliff House. At his retirement in the 1970s, Joseph Selle donated to Rochester's Visual Studies Workshop the film negatives - over a million frames - on 1000 rolls of 35mm movie film – each 100 ft long. The surviving film negatives date from the 1950s-1970s. By any archival standard this is a mammoth collection. It may be relatively compact in volume, but one doesn't easily gain an overview of a million images - especially negatives. 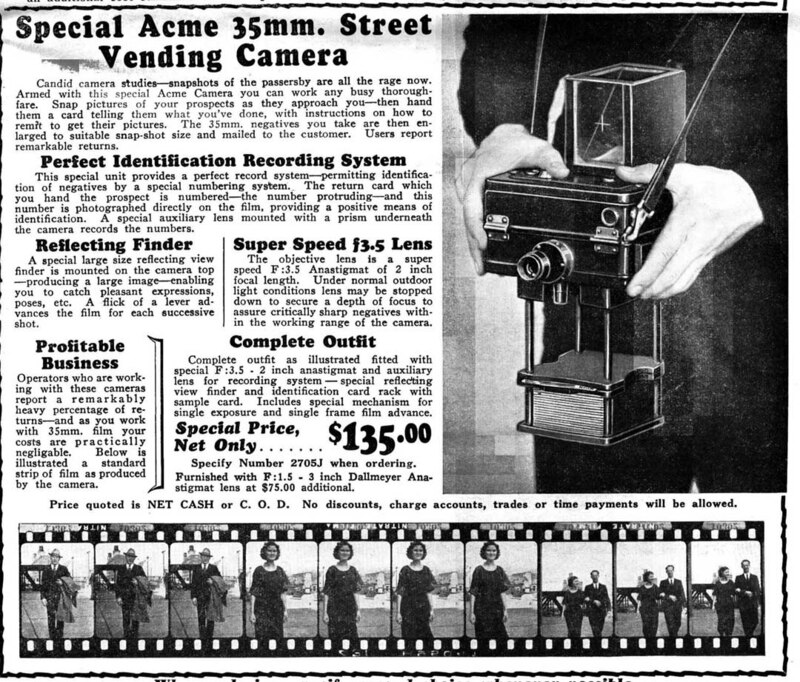 Selle and his associates used modified DeVry 35mm movie cameras (marketed as "Acme Street Vendor Cameras") oriented sideways and worn on their chests. An extra fitting on the cameras held serially numbered tickets dispensed to each subject as they were photographed. The ticket number was captured at the edge of each film half-frame. Today, we have little record of how many frames were purchased or which ones they were. Often we find one or more frames in which the subjects were clearly cooperating with the photographer by posing. Presumably, these sold. Today more than ever we feel free to apply a totally out-of-context aesthetic in judging odd juxtapositions, chance gestures, dress-up clothing of the period, occasional automobiles, the 1950s commercial architecture, the retail façade, or just plain interesting and sometimes beautiful people. Repurpose, recontextualize - not only are these totally acceptable practice, they are really our only choice as any original order and identification the 1000 rolls once must have had in Selle's office on Market Street have long ago been lost. Today, we're dependent on internal evidence for any dates and identification we establish. To our knowledge, there is no similar collection of photographs anywhere – not in public archives, not owned by picture agencies, not on-line, not even in private hands. There are anecdotes from people who remember the guy in uniform who was the regular fixture in the Market Street/Union Square area. He had repeat customers. Some even ordered multiple prints. A trip downtown was once a sufficiently memorable occasion to justify commemorating it with a 50 cent souvenir photo. Although he photographed pedestrians alone, photos of couples, families, parents with kids, friends out together are predominant. Look at all those white gloves and furs!! Give a moment’s thought to how you might approach a collection numbering as many as a million negatives. Even with an efficient and affordable printing system, the physical handling challenge is overwhelming. The magic enabler is the technology developed for digitizing motion picture footage. The cost of real-time scanning of 35mm film footage has become relatively affordable. Thus, following the links below, you can now review about 10% of this collection - the 100 rolls scanned so far yield 100,000 images. Also be sure to review some of the creative projects inspired and derived from these images. Your ideas for future projects are most welcome.